We take great pride in transforming your property into something beautiful, sustainable, automatic and low-maintenance. HARDSCAPING SERVICES Our motto is “Brickwork, Irrigation and Lighting,” and that is pretty much what we do. We will replace your cracked concrete, worn asphalt driveway or walkway with beautiful paving stones that are rugged and replaceable. Underneath those paving stones, we will install conduits for power and water to run your lighting and irrigation system (which will be automatic and won't turn on in the rain - because that's just dumb). Your new lighting system will provide a beautiful atmosphere to come home to and security once the sun goes down. These lights will be automatic and will come on at dusk and stay on for as long as you want them to. All your flower beds will be watered automatically via a subterranean watering system, which will give you a consistent garden throughout the year. Because the system is underground, it won't throw water all over the neighbourhood, nor will anyone know it's on. You can water anytime, and for as long as you like. We can remove part of your lawn and replace it with maintenance free river rock gardens, patios or salt & pepper gravel beds. 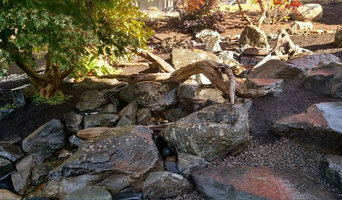 We also install water features, and if you would like a pond-less waterfall in your backyard, we are the guys to do it for you. PEACE OF MIND At MnR Hardscaping, we go above and beyond to ensure our clients are satisfied. •We stand by our work and we won't leave your property until you are completely satisfied with what we have done. •We are incorporated, with $5 million in liability insurance. •We are members of the “Interlocking Concrete Pavement Institute” •We are Level I and Level II Irrigation Installers by the IIABC. •We won't show up in vehicles that leak oil all over your driveway, and none of our workers will be seen smoking on your property. CONTACT US Call us today for a free, no-obligation estimate and we'll show you just how maintenance-free and beautiful we can make your property. Based in Oak Bay and serving all of Victoria! "Blue" approved! Not gifted with garden tools? Professional Lofall landscaping companies are your best bet to get lush, lovely grounds year round. Hire a landscaper to create and maintain a beautiful yard that complements your home and blends into its native setting. From soil, grasses and plants to decks, walkways and patios, Lofall landscape contractors are well versed in the components that make up a functional and visually pleasing outdoor living space. 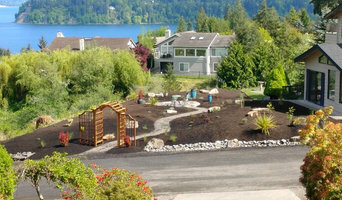 Learn more about how a landscaping company in Lofall, WA can help you with your yard below. What does a Lofall landscape contractor do? 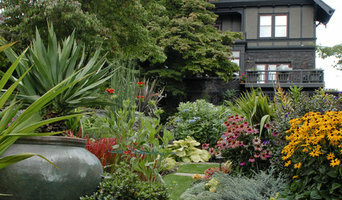 Landscaping contractors execute lawn, garden and hardscaping plans that have been drawn up by an architect or designer. They may also provide design services on their own. After the everything has been installed, landscape companies can make adjustments, maintain plantings, take care of weeds and pests, and perform other tasks to keep the scheme looking its best. A licensed Washington landscaper should have detailed knowledge of Lofall, WA weather and climate trends and conditions, and can choose plants and materials that are well suited to the area. 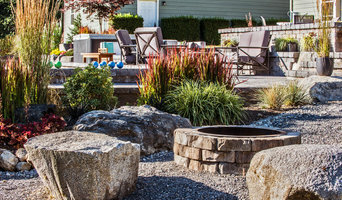 Residential landscape companies in Lofall, WA also handle many of the same general duties as builders, including arranging for construction permits, hiring subcontractors and making sure that designs comply with Washington building codes. Find Lofall landscaping services on Houzz. 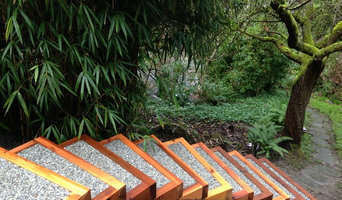 Narrow your search in the Professionals section of the website to Lofall, WA landscape contractors. You may also look through photos of Washington landscapes to find one you like, then contact the landscaping company in Lofall, WA who worked on it.